Published: Aug. 25, 2018 at 01:32 a.m.
Oakland Raiders running back Chris Warren powers his way into the end zone for his first touchdown on the 1-yard run. Published: Aug. 18, 2018 at 06:35 p.m.
Oakland Raiders running back Chris Warren rushes for a 23-yard gain vs. Los Angeles Rams. Published: Aug. 18, 2018 at 06:30 p.m.
Oakland Raiders running back Chris Warren bulldozes into the end zone for 3-yard touchdown vs. the Los Angeles Rams. 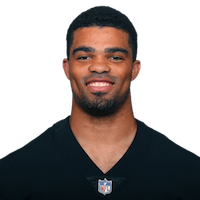 Published: Aug. 11, 2018 at 12:41 a.m.
Oakland Raiders rookie running back Chris Warren rumbles down sideline for 26 yards.